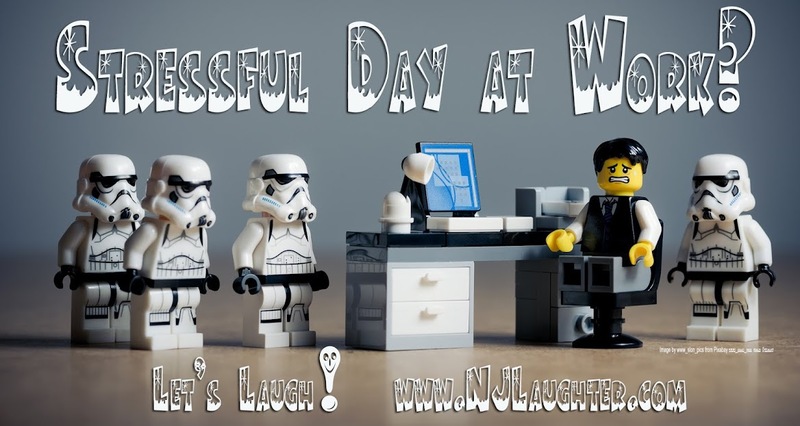 After taking the Northeast Regional train into Penn Station in New York City, from Metropark in Iselin, New Jersey, I was greeted at the Amtrak waiting area by smiling Amtrak employees giving out snicker doodle cookies. They asked where I was going, and whom I was going to see. When they heard I was going to Iowa to see family – specifically two grandchildren, they fixed me up with extra cookies. I promised to try my best not to eat them all on the way. I’ve been looking forward to this trip for quite a while. I’ve missed my son, his wife and their two little girls terribly. They left New Jersey for Iowa almost three years ago, and I am still not used to it. I’m a mother who like her children close by, and that feeling is more intense now that I am a grandmother. I’ve been to Iowa three times before, the first time to accompany my recently-knee-ligament-replaced son and his daughter via airplane to their new home, while his wife and mother in law drove the car from New Jersey to Iowa. That trip was a whirlwind of helping with unpacking with an extra-special side trip to the future birthplace of James T. Kirk. We had just missed the annual Star Trek festivities by a week. On the second trip, the Love of My Life (LOML) came along to meet the new baby girl, and last year I flew out solo for her first birthday. 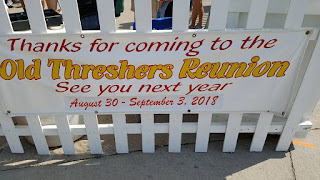 While there, I was introduced to a yearly event in Mount Pleasant Iowa that must quadruple the population every end of August. 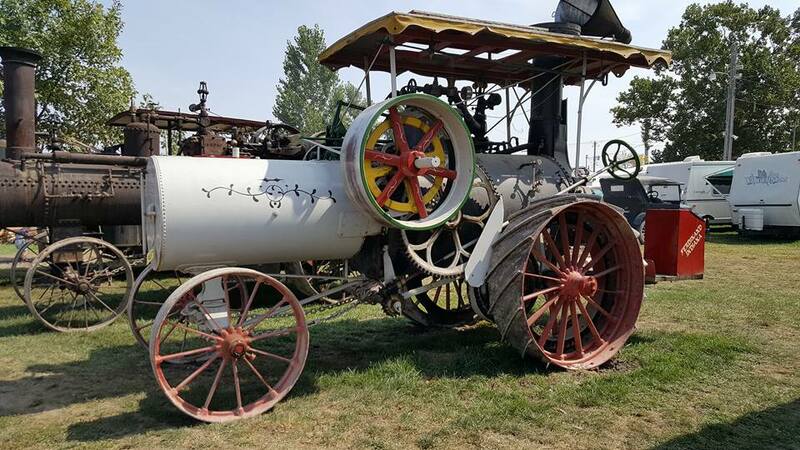 The Old Thresher’s Reunion is more than a farm machine extravaganza, although the rows and rows of steam-powered equipment is mind-boggling. These “threshers” and other things are paraded around, judged in competition, their smoky presence giving a distinctively different aroma to what looks very much like a country fair. 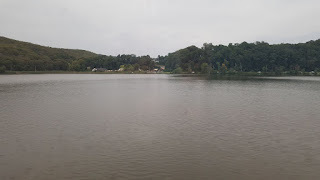 Most amazing to me, was that this little town accommodated the thousands of visitors, many of whom fill the surrounding camping areas to capacity. A huge dining pavilion offers nightly dinners prepared by local organizations such as boy scouts and churches. Craft vendors sell their wares both on the fair grounds and in the center of downtown that looks just like the town square in Back to the Future. 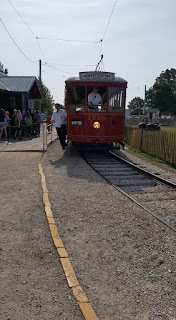 Railroad tracks encircle the fairground, and there are daily rides on several well-preserved steam trains. A passel of cowboys accompanies the riders, and sooner or later there’s a train robbery and a shootout that takes places in a reconstructed old-time village. We enjoyed stepping into the jail cell (as long as the door remained open) the country store, and a genuine post office.As if that wasn’t enough, on the other side of the fairground you can ride on electric trolley cars that come from as far away as San Francisco and Italy. 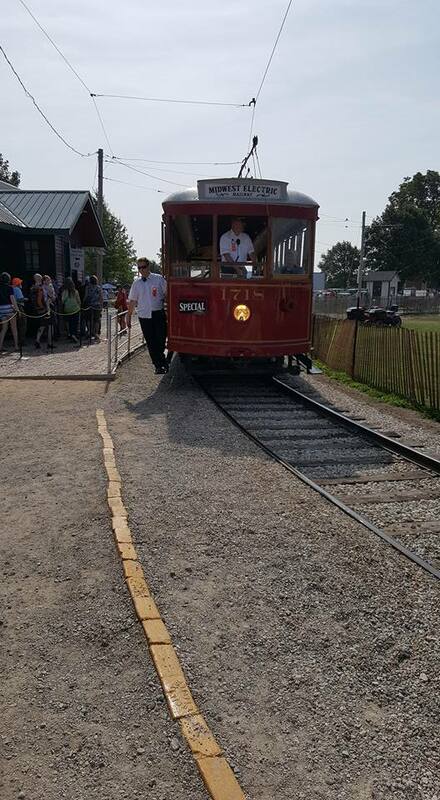 The trolley drops you off at another historic reconstruction, this being typical log homes and buildings of a bygone era. So, here I am, heading there again, this time having an adventure by train. 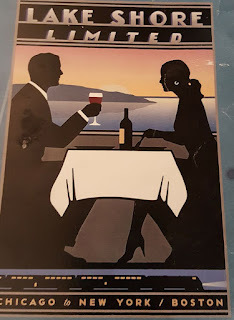 I’ve just boarded the Lake Shore Limited in Penn Station, and will be riding overnight to Chicago. 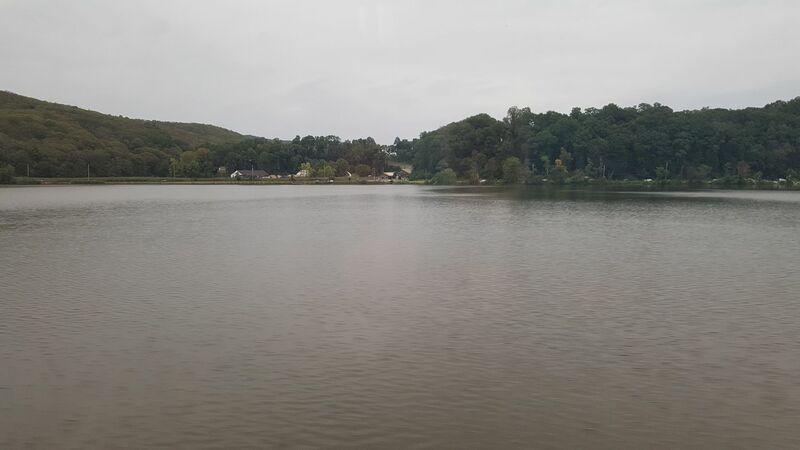 We have just passed Croton-on-Hudson, and although it is a cloudy day, I can still appreciated the beauty of the Hudson River on the left side of the train, and glimpses of the towns, homes and roads out the right side window. Someone from the Dining Car has just come by to take dinner reservations, and I have chosen 8:15 PM, a very cosmopolitan time for dinner, after the sun has set and we will be riding through a darkened landscape. The car is quiet, some people are already napping, others, like me, are tapping away on laptops, or looking at cell phones, or read actual paper books or e-readers. I feel sad for the person who is already asking when the train will stop so she can have a cigarette – the train is absolutely no smoking. I can see out the window that the land is becoming hillier as we head north, and across the lake I can see another train. I am guessing that there is a big loop around and we are going to pass each other shortly----oh there they go! I am going to settle back for a while, listen to my audiobook and watch New York go by outside my window.